Chicago Restaurant Week is an event that attracts Chicagoans, Midwesterners and even international folks every year. The event is designed to celebrate the rich history of Chicago restaurants. The event actually lasts for two weeks, and visitors can enjoy competitive prices at top-rated restaurants in the area. Chicago Restaurant Week is also intended to boost the economy and increase profits for restaurants in the area. All types of restaurants enjoy profitability during Chicago Restaurant Week. From sophisticated venues to the local diner, restaurants generally enjoy an eight percent jump in profits during Chicago Restaurant Week. Participation in the event has been drastically increasing every year. As restaurant owners discover the advantages of becoming part of Chicago Restaurant Week, they have joined in on the fun. In 2013, a total of 286 restaurants participated in the event. Restaurants served over 513,000 meals during Chicago Restaurant Week in 2013. The way it works is that participants are able to choose a $22 lunch and dinner that amounts to $33 or $44. Restaurant goers choose meals based on fixed menus offered at the participating venues. Many restaurants choose to promote their specialty dishes during the two weeks. If you are interested in participating in Chicago Restaurant Week, you should plan on visiting the area from the end of January to the beginning of February. The timing of the event is always subject to change every year, so you should check with an official source to verify the timing of the event. If you want to participate in the festivities, you need not purchase tickets. All you need to do is locate the list of participating restaurants. Once you know which restaurants are participating in the festivities, you can choose which ones you wish to visit. You may want to take time to make reservations at the restaurants that you want to visit. Restaurants typically have long waiting lines during the Chicago Restaurant Week. You can bypass wait times if you have reservations already set in place. You can make reservations by calling the restaurant or by filing a reservation on EatItUpChicago.com. One of the best aspects of participating in Chicago Restaurant Week is that some restaurants choose to offer multiple courses. At a restaurant like Blackbird, you can enjoy a three-course lunch for only $22. Even better, Blackbird maintains its lunch special throughout the year. Part of the fun of being part of Chicago Restaurant Week is trying dishes that you may have never tried otherwise. You may be in the mood to try some deep-dish pizza, Asian-fusion sushi, pub grub or gourmet soup. Because so many restaurants participate in the two-week event, you can find a restaurant that will satisfy your craving. Enso Sushi is one of the hottest spots to grab some excellent sushi. Michael Jordan’s Steak House is an incredible place to visit if you wish to enjoy the best steak that you have ever had. City Tavern and Tavern at the Park are great places to visit for a frosty mug of beer. RPM Italian is a wonderful restaurant to visit if you want to enjoy some authentic Italian cuisine. Certain restaurants tend to receive high ratings for the dishes they serve during Chicago Restaurant Week. You may want to consider visiting a place like Joe’s Seafood or Ing Restaurant if you want to enjoy dinner in a beautiful ambiance. Embeya is a wonderful place to host special guests, given the gorgeous chandeliers that adorn the main dining area. Travelle has a funky, modern ambiance and also serves its own Mediterranean dishes. The restaurant is located in the Langham Hotel and is also a great place to grab a couple of cocktails. Cafe Spiaggia is the ultimate place to enjoy an Italian lunch or dinner. Take the time to check out all of the offerings at Chicago Restaurant Week. You may just find your new favorite restaurant in the area if you are a local. 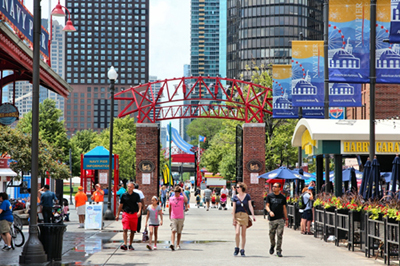 If you are from out of town, you can enjoy learning a bit of Chicago history and embracing the unique culture that the city has to offer. This entry was posted on Friday, February 17th, 2012 at 3:33 am	and is filed under Cities & States, Office Talk. You can follow any responses to this entry through the RSS 2.0 feed. You can leave a response, or trackback from your own site.